We don’t just provide a box of software. We provide a total package including “after-sales support”. Our aim is to provide you a truly usable system including “personal” support. We have more than twenty years of experience in implementing our application packages and we are staffed by professional consultants who have extensive knowledge in system and business operations. Such consultants provide you the services ranging from initial setup support to after-sales support. Having developed “Plaza-i”, we naturally know how we can get the system up and running quickly and effectively. After you contact us, we will have meetings to understand your business and give you demonstrations using data sheets before you purchase Plaza-i. Our specialists will make a “recommended and reasonable” proposal that meets your company needs, considering the latest information. This phase of Proposal includes proposals for Plaza-i modules, service structures, schedules, pricing, platform configuration such as hardware, etc. After the hearings of your detail business description, confirming and defining your requirements, and Fit/Gap Analysis by appointed consultants, we will propose you the most appropriate way of implementing “Plaza-i”. Based on the Fit/Gap Analysis started at the phase of Proposal and completed at Consulting, we will create add-on functions, screens or reports to customize gaps. Plaza-i is one of the few package systems that are able to be upgraded after customization to satisfy your business requirements. Based on the implementation and operational policies determined during consulting sessions, we will provide support services for master data set-up, beginning balance entry, and so on. And then training sessions will be provided including master items maintenance, daily operations, and closing processes. These training sessions will be completely private so that you can learn how to utilize the system effectively. Implementation support will come to an end after we review operation results containing one month worth of monthly-closed data and see if system implementation goals are accomplished. We will then proceed to the next phase of the on-going support. After the implementation, on-going support services will be provided by our experienced support staff who help you to use “Plaza-i” efficiently. Furthermore, via the Plaza-i Platform Support Service (PPSS) contract, you are eligible to one-stop services that satisfy Business Continuity Planning (BCP) including hardware. To get the most of “Plaza-i” and to continue to use it effectively, we provide you reliable and continuous support services. As the developer of Plaza-i, it is possible for us to make additional functions as needed. Plaza-i grows together with you. Also, in order for our users to get even more from Plaza-i, we conduct Plaza-i seminars on a regular basis. CRP (which stands for Conference Room Pilot) is an implementation method to simulate and make sure of business operations in practice by inputting various transactions in the package system at the earlier stage of defining requirements. 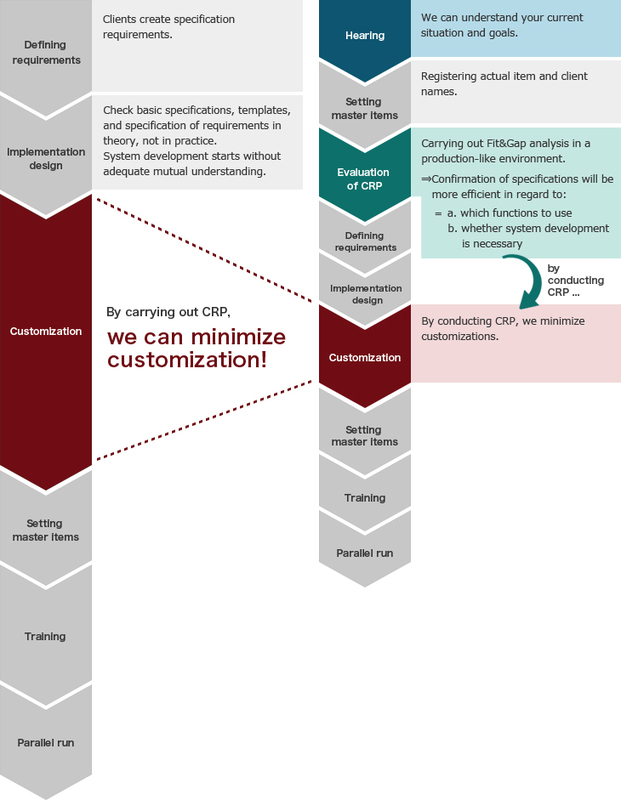 Although CRP is an effective implementation method that is available to package systems only, this is not applicable for all projects or package systems. Since Plaza-i incorporates business practices of a diverse array of business categories and its code structure such as client and item codes are flexible and versatile, it is possible to implement CRP in an environment similar to actual operating conditions. In case we come to a conclusion that setting parameters, etc. is not good enough to support your core competencies, our system engineers who know “Plaza-i” inside out will program and add a necessary function to the package system. Due to differences in experience and knowledge between a solution provider and client, they may not be able to reach mutual understanding. Accelerates mutual understandings and shortens the time required for specification confirmation. End-users can continuously participate in the implementation project.